David Woerner, Valeria Vincent, Tanya Ruffin, and Debra Cross from the LSU AgCenter will each host breakout sessions on a variety of topics relating to the use of technology. The Connect My Louisiana Summit will be held on March 6, 2013 at the West Monroe Convention Center, 901 Ridge Ave, West Monroe, LA 71291. Registration will begin at 9:30 a.m.. with opening remarks at 10:00 a.m. 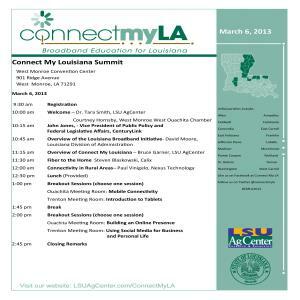 The Connect My Louisiana Summit will feature success stories, speakers and educational modules that showcase effective uses of technology. There is no charge for the summit, but prior registration is required. Lunch will be provided to all registered participants.